Like many in the startup world, Stu Crair saw an opportunity and seized upon it. He acknowledges his timing for founding the Digital Workshop Center – which specializes in helping students of all ages learn technical skills such as website design and management, Adobe software, digital photography and video editing, Microsoft Office and QuickBooks – was pretty good. “People were realizing that, and the pace of the digital world (transformation) was speeding up,” Crair recalled. “People were seeing there were skills they needed for a lot of careers. Another 30 percent are the general public, he said – people who are pursuing a hobby or adding a skill. Students at Digital Workshop Center run the age gamut, but there are some similarities. “They’re mostly 45 and up in age, and about 70 percent are women,” he said. B2B students are often administrators, human resources officers, IT specialists – even bankers and Colorado State University professors. Government employees – city, county, state and federal — are probably his company’s biggest source of students, Crair noted. The City of Fort Collins has been a “huge” customer for Digital Workshop Center, Crair said. Doreen Kemp, the city’s learning and organizational development manager, said DWC has helped the city create more valuable employees. “Digital Workshop Center has been exceptional in providing specific and customized technology skill development for the city’s workforce,” Kemp said. Crair said he’s currently looking at a possible second center location in the north Denver area. The center’s instructors are a diverse group – including local business people and retired tech workers. Crair said he’s looking forward to many changes in 2015, including new classes in MailChimp, SEO, Photoshop and the new partnership with Bloc Bootcamp. 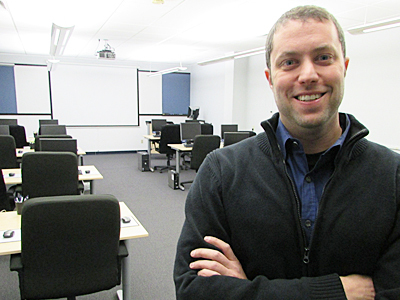 “We’re at the forefront of digital trends, and we are innovative in how we continually adapt to teach at all skill levels,” he said.